Can different technologies make a home more livable? Do specific technologies change a home's affordability, durability, quality, energy use, and disaster resistance? The FPL answers these questions with a resounding yes. World's largest earthquake shake table test. We know that a home is a complex system of components and that technology innovation can improve the performance of a homes individual components and integrated systems. Creating advanced technologies and alternative building methods can greatly enhance the value of wood in residential, nonresidential, and transportation structures. The FPL has been in the forefront of wood-frame housing research since 1910 and has long been recognized as a world leader in such housing-related areas as engineered wood products and structures, moisture control, material design and performance, coatings and finishes, adhesives, wood preservation, and composites. 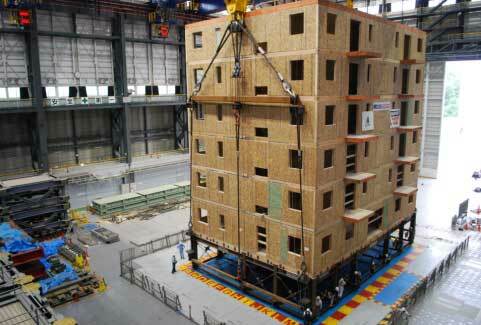 Many of the materials and technologies currently used in wood-frame housing were developed through basic research at FPL in cooperation with industry, academia, and government. Wood has been used as a structural material for thousands of years. Despite the development of other materials, wood continues as a primary structural material and is widely used because of its excellent performance characteristics and affordability. Additionally, wood helps to mitigate climate change. Using wood in building structures extends the carbon storage beyond the life of the tree throughout the life of the product, and later, through recycling. Life-cycle assessment studies have shown that wood frame buildings represent a significantly lower environmental burden than buildings made of materials such as steel, concrete, and bricks. As we move into the future, lumber used for housing is likely to continue to come from plantation-grown trees and small-diameter secondary species (substitute woods). We need to further research and develop more efficient and durable structures that are adaptable to these sources from our changing forests.